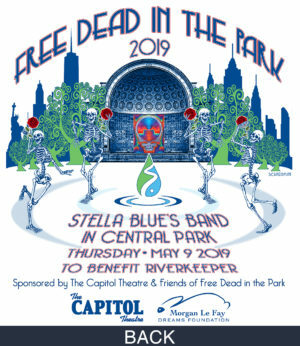 Stella Blue's Band returns this year for the second annual Free Dead in the Park concert to benefit Riverkeeper, New York's clean water advocate. 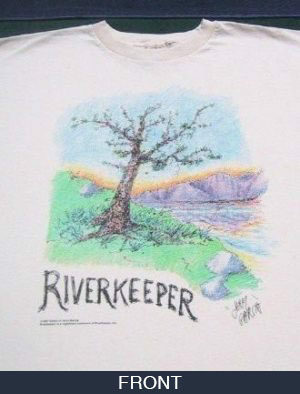 New this year: Exclusive commemorative t-shirts featuring original artwork created by Jerry Garcia himself in 1992 for Riverkeeper's benefit. Get yours with a $40 donation. If you cannot pick up your shirt at the show, please help us cover shipping costs by donating $47.25 or more. Claim your complimentary shirt with a gift of $40 or more: Claim your complimentary shirt with a gift of $40 or more: Free Dead in the Park 2019 Concert Tee No T-shirt, please! Will you pick up your t-shirt at the concert? Your donation to the "Free Dead in the Park" concert will allow Riverkeeper to count you as a member, and will help us achieve our vision of a living Hudson River, flowing with clean, swimmable waters from end to end, and abundant safe drinking water for all New Yorkers.